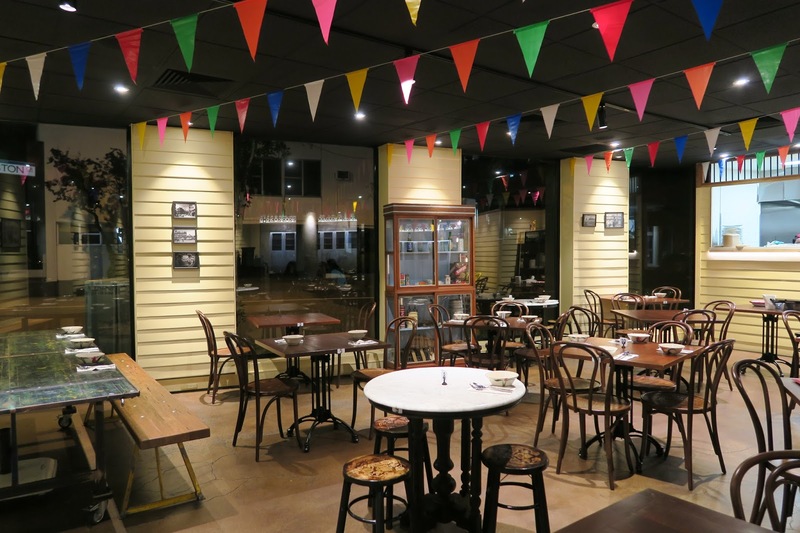 Nara Thai Street Food is one of the newer additions to South Melbourne, although it’s pretty much in the CBD. 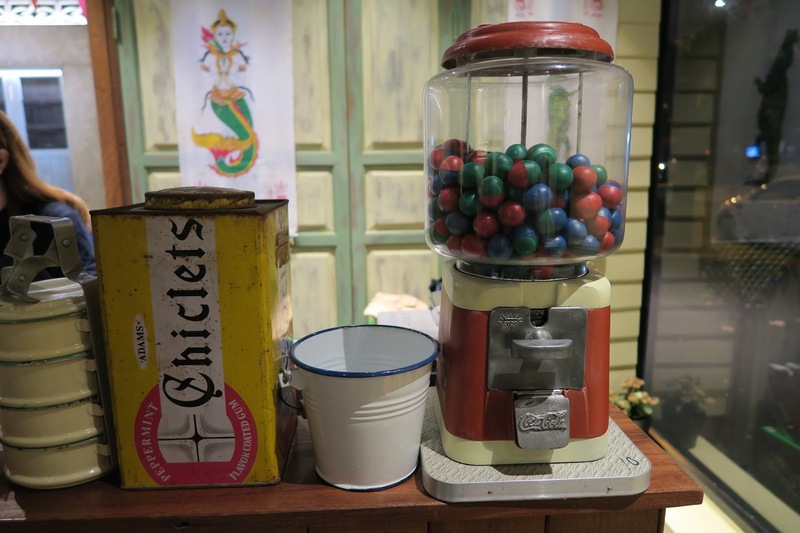 It’s filled with knick-knacks that are reminiscent of the street of Thailand – not that I’ve been, but hey, I’ve seen plenty of pictures. 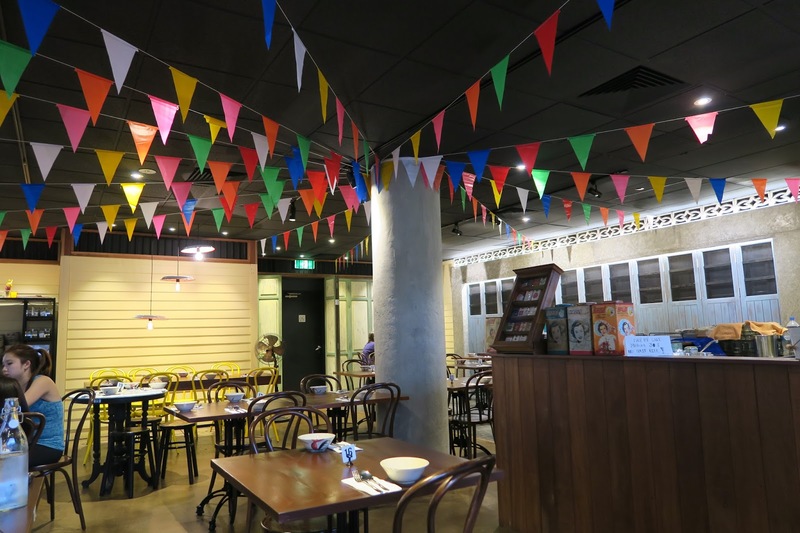 Over the top of the restaurant, there was a rainbow pennant, giving the space an inviting and playful vibe. Nara Thai’s menu was pretty long, and had some traditional offerings, such as green curry and tom yum, to some less well-known Thai dishes. We tried to order a bit of everything, and as always, ended up over ordering. 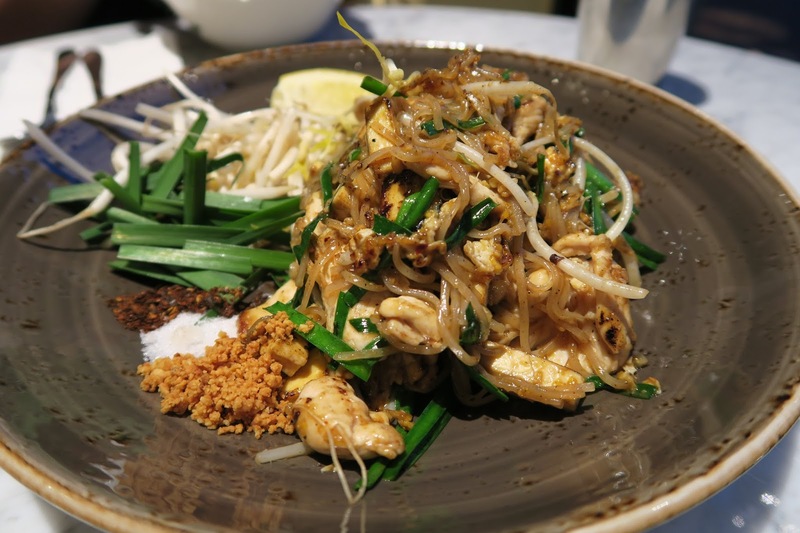 We started things off on the traditional side of things, with a serving of chicken pad thai. 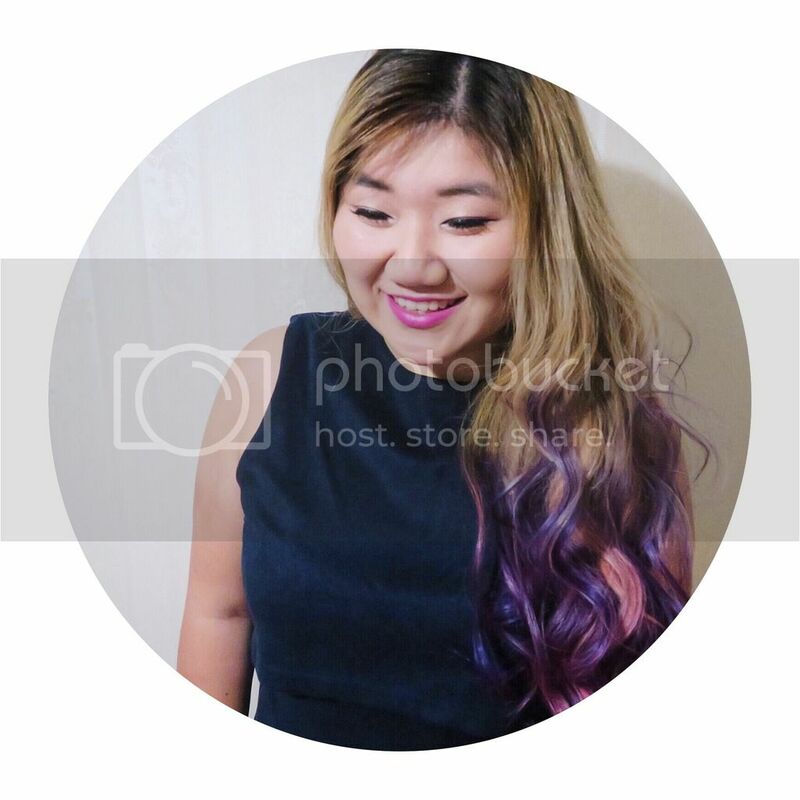 Does anyone remember that ridiculous song about chow mein or fried rice or whatever it was btw? No? Just me? All good. Anyway, the pad thai was piled up high (that rhyme though), and was tempting us with its glistening noodles. There is also an assortment of accompaniments on the side, that you could mix in if you wish. We just ahead and mixed everything together, ’cause #yolo. The result was amazing, in fact, this is probably the best pad thai I’ve ever had. The noodle had a nice stretch to them, the ingredients were fresh, and the flavour was right on the brink of being the perfect kind of sweet yet sour. 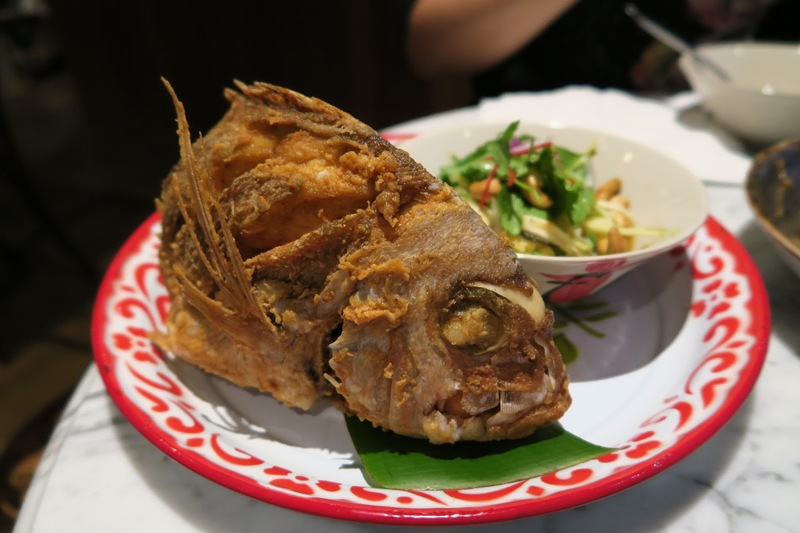 The chef at Nara Thai were very kind, and the giant plate of fried whole snapper was placed in front of us on the house. The snapper had a light cornflour batter, and the large chunks of flesh were mostly very succulent, however, there were drier pieces in the mix. The mango salad on the side was very refreshing, and I loved the addition of roast almonds, which added both texture and flavour to the salad. 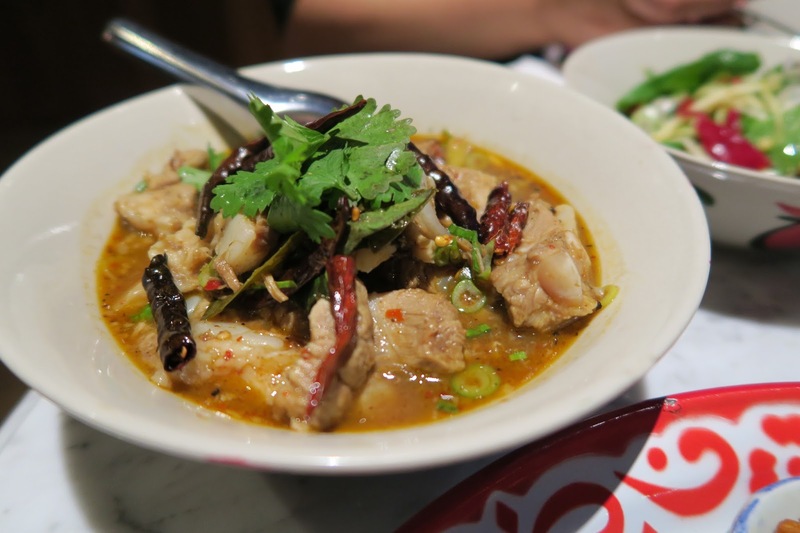 Tom Sap is something that I’ve never heard of before, but I am familiar with my mum’s home cooked pork soft bone soup. This was nothing like my mum’s version though, with a myriad of spice and herbs added into the soup, which gave it a ton of dimension flavour wise. It was more on the stew side of things, with plenty of pork soft bone to be crunched on. 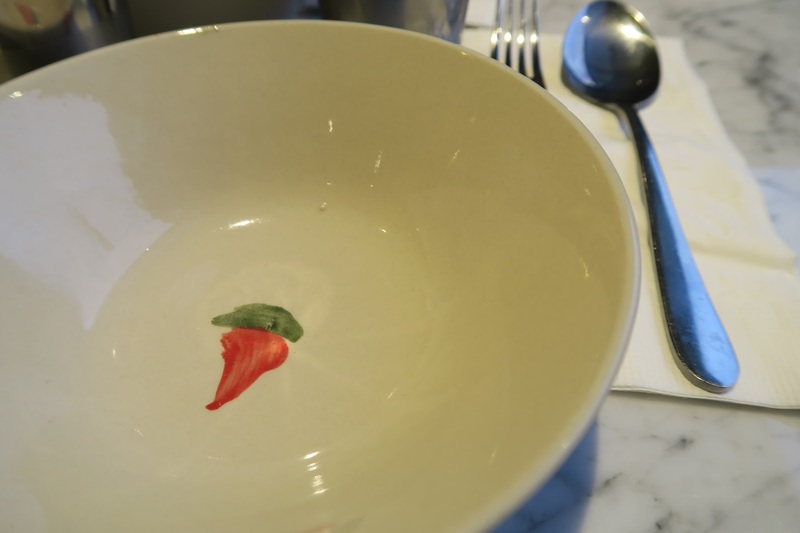 The soup was very sour, and not overly spicy, despite the scary looking dry chillies. If you don’t know already, I am a garlic fanatic. So when I spotted the fried garlic pork, it was a no brainer to order it. 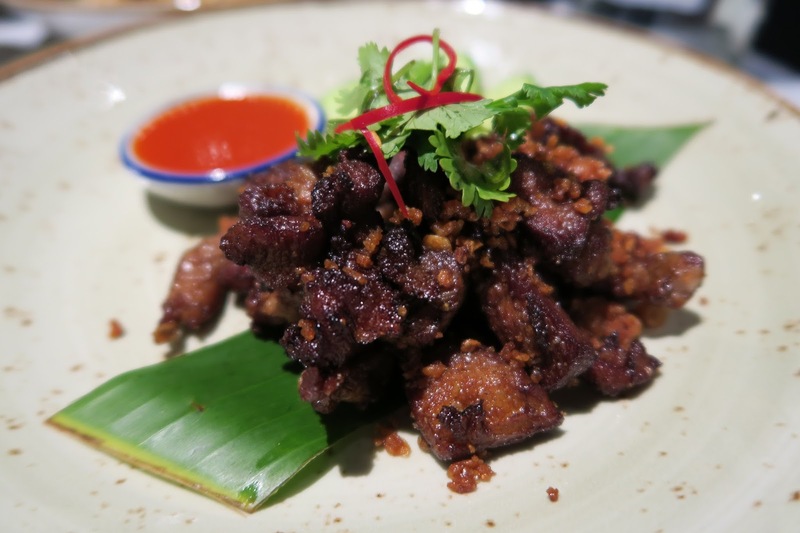 The pork was lightly fried, before being tossed with some diced fried garlic, and the result was tasty pieces of meat, with quite a bite to it. If you don’t like things that requires some jaw workout, then this is not for you. Personally, I did enjoy it, although I didn’t think it was particularly Thai flavour wise. 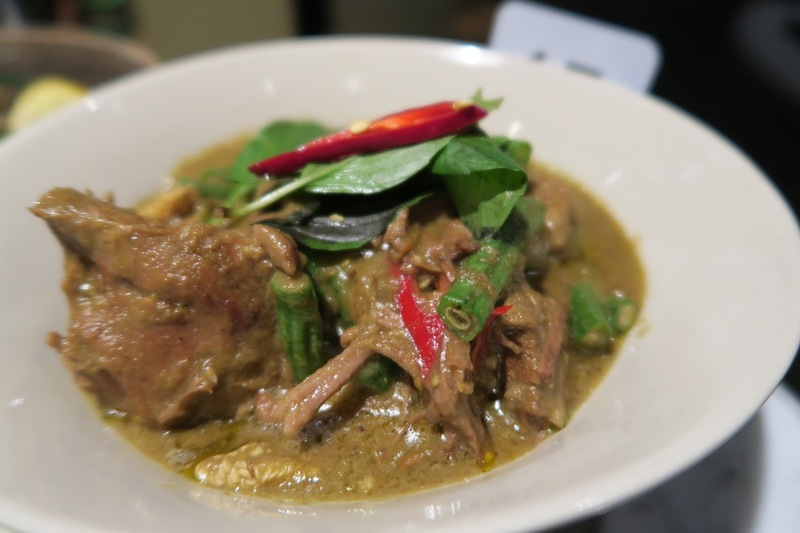 We originally wanted to try the Massaman curry, which was sold out on the day unfortunately, so we settled on the green beef curry instead. It’s actually something I’ve never had before, since it’s typically green chicken curry that’s on the menu. The large chunks of beef has been stewed over a long period of time, resulting in some extremely tender meat, which broke apart at the probe of some chopsticks. The curry was darker than usual, and was very fragrant and spicy, great for mixing with some steamed rice! 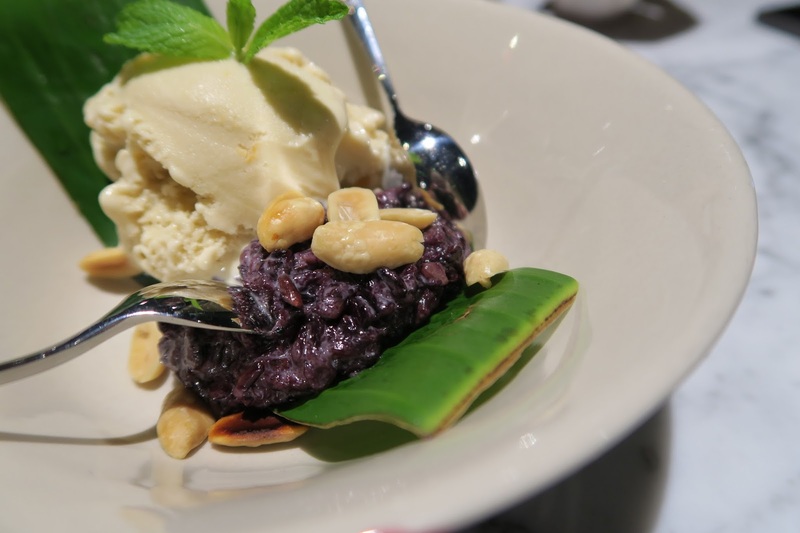 The generosity of the restaurant continues with a complimentary dessert, which comes in the form of sticky black rice and coconut ice cream, a classic combination. The rice was, you guessed, sticky, and a little salty, which actually paired perfectly with the sweet and creamy coconut ice cream. 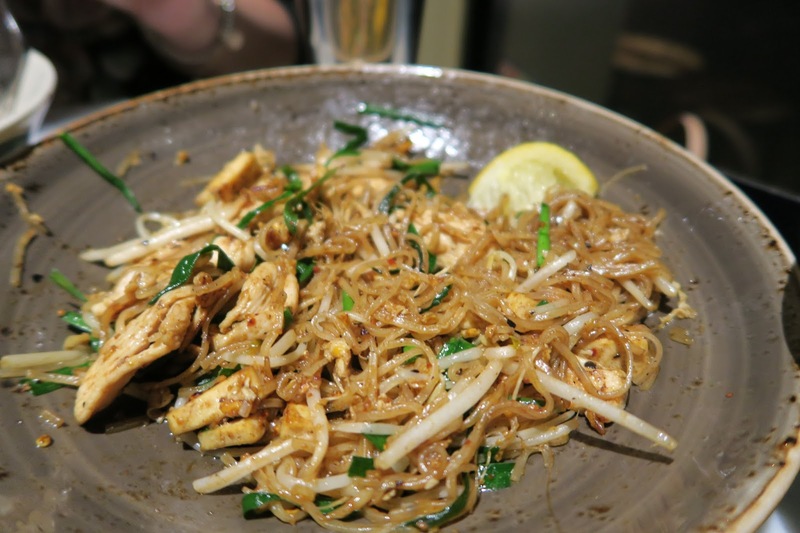 Nara Thai was a pleasant surprise, the flavours kept true to traditional Thai food – what I know of it anyway, and the servings were very generous. 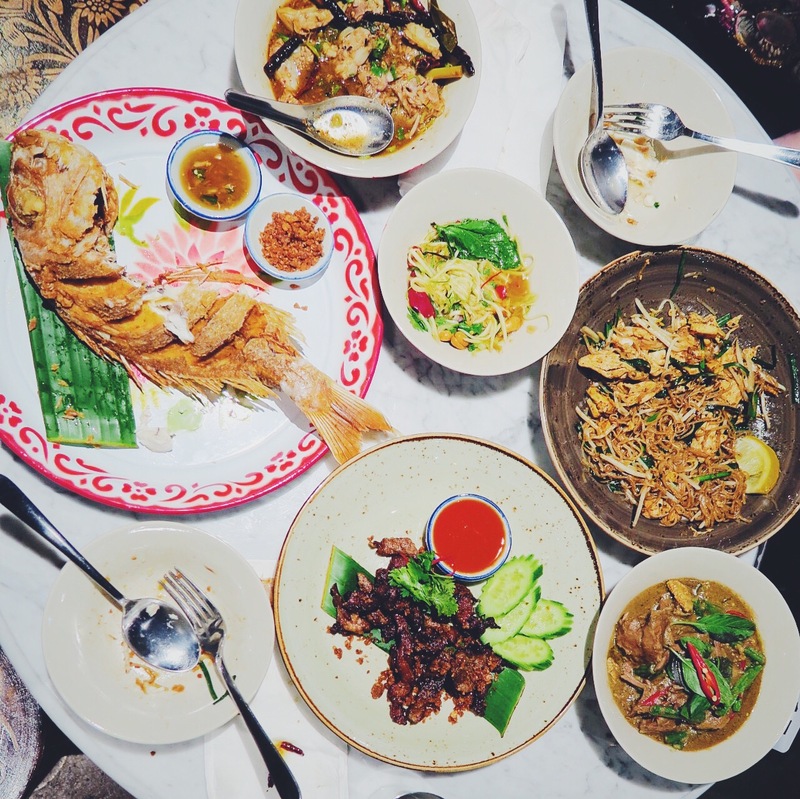 The restaurant remained relatively empty throughout the night, so next time you have to wait for a good 30 minutes at Jinda Thai, why not take a detour and come to South Melbourne instead? Catch any tram from the Federation Square/Swanston Street stop that’s heading out of the city, and get off at stop #20 Domain Interchange/St Kilda Road, and the restaurant is 3 minutes walk away. I am behalf of Nara Thai street food Team. Thank you for your visiting. We’re glad that you have a good experience with Nara Thai. We would like to ask your permission to publish your review on our Facebook page. We’re in processing of create pages on social media to keep in touch with our customer.